We left the east coast of Florida and traveled west to the W.P. Franklin Locks Park on our way to a two week volunteer opportunity with Habitat for Humanity in Fort Myers, FL. This Army Corps of Engineers facility consists of a dam on the Caloosahatchee River along with a lock that is used by boats to pass around the dam. The dam controls water flow westward along the Okeechobee Waterway which stretches across Florida from Fort Myers on the west coast to Stuart on the east coast. The waterway is part of a massive water management canal system that diverts water from Lake Okeechobee into rivers which flow to the east and west coasts of Florida. As mentioned in a previous post, large amounts of polluted water flows from Lake Okeechobee and is believed to be a major contributor to “Red Tide” along Florida’s coasts. Habitat for Humanity (HFH) is a non-profit which builds and renovate homes for lower income families to purchase through affordable mortgages. Bonnie and I had previously volunteered for a one-day build at Habitat for Humanity when we lived in Charlotte, NC and we really enjoyed the experience of building walls for a future homeowner. This time, we would be working for two weeks at the Habitat for Humanity chapter in Fort Myers. Through the Care-A-Vanners HFH program we were provided with full RV hookup (sewer, water, & electric) located in a fenced yard next to the HFH warehouse which also doubled as a wall fabrication factory. Fellow HFH volunteers were also camping next to us in their assigned parking areas. Work started promptly at 7:30 am in the morning and we hammered nails until 3:30 pm in the afternoon from Tuesday thru Saturday. A 15 minute water break and a 30 minute lunch break were given each work day. We were fortunate enough to be partnered with fellow volunteers (Robin, Ralph, & Gail) who actually knew what they were doing so we learned a lot about residential wall construction from them. It was hot with temps in the high 80’s each day but we were lucky once again because the warehouse needed us to build walls for homes that were scheduled to be built. As a result, we worked under roof and avoided the hot sun each day as we built enough exterior and interior walls for 4 homes. The warehouse staff (Carlos & Daniel) seemed to be very pleased with the number of walls that were built during our two week volunteer assignment. On one very hot day, we traveled to an active HFH construction site and helped raise walls we had built for that particular house. It was very rewarding to work with future homeowners while building walls or performing other assigned tasks towards the goal of home ownership. Each prospective homeowner is required to be a U.S. citizen or permanent resident, be employed, take financial literacy classes, and volunteer a minimum of 300 hours in order to be accepted into the HFH program. One corner of the house is up !!! Happy homeowners at job site !!! We left Fort Myers on the west coast and headed to Lake Worth on the east coast near Boca Raton. Bonnie reserved a convenient campsite for us at John Prince Park in Lake Worth which is a county park located about 30 minutes from Boca Raton. This location was fairly close to my father-in-law who lives in Boca so we planned on spending Thanksgiving with him and his long-time girlfriend. Another reason we picked this campground is because it is near my newly discovered sister, Valerie Smith, who owns a home in Lake Worth. The story of how my new sister and we found each other is an amazing one that started with submission of DNA samples through Ancestry.com. In April of this year, Valerie contacted me via Ancestry.com when DNA analysis showed us tied to the same biological father. Needless to say, I was shocked and excited that a new sister I had never known wanted to meet with me. Prior to this trip, we had talked on the phone several times and met briefly for lunch in New Hampshire on Mother’s Day. I spent the next couple of days getting to know my sister, Valerie, and her wife, Dawn, who chauffeured me and Bonnie around Forth Worth and surrounding areas of interest. We dined together at this really fantastic eatery, called Havana Restaurant, in West Palm Beach and enjoyed traditional Cuban dishes such as shredded beef in spanish sauce (Ropa Vieja), plantains, black beans (Frijoles Negros) & yuca (Yuca con Mojo). Valerie’s partner, Dawn Garcia, is from Cuban ancestry and she was trained as a chef so this girl knows good food !!! New sis, Valerie, took me to this really neat place, called Old Key Lime House, which claims to be the oldest restaurant in Florida. We walked to the back of this historic house and sat out on a large deck that sits right on the beautiful intracoastal waterway. This was definitely a great place to have a couple of beers and talk about our shared Collins family heritage and anything else that popped up. One evening, Valerie and Dawn invited us over to their house for dinner and Dawn cooked another incredibly delicious Cuban dish, called Picadillo Estilo Cubano, which consisted of ground beef, olives, peppers, and onions. We played some board games after dinner and had a great time trying to beat each other at games we played. Next, we traveled south to Boca Raton and spent Thanksgiving Day with my father-in-law, Don Wilder, and his partner, Carole Rich. They hosted dinner at their condo and Bonnie’s cousins, John and Stormy, along with John’s lovely wife, Amanda, came over for Thanksgiving dinner. The turkey, the ham, and side dishes were all delicious so we pigged out and enjoyed a very nice holiday meal together. Bonnie hadn’t spent much time with her cousins so this was a really nice way for her to get reacquainted with them. 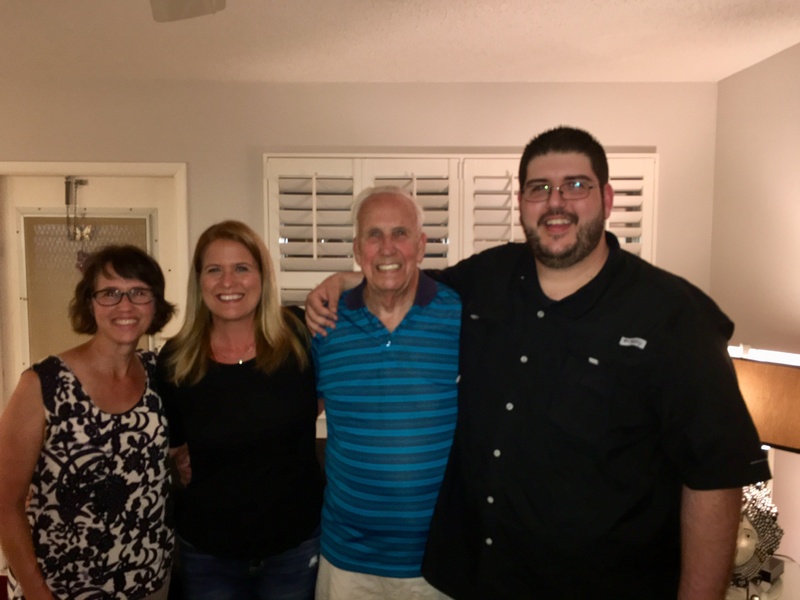 Previously, they had invited us over to their house in Cape Coral for a delicious dinner back when we doing the Habitat for Humanity build in nearby Fort Myers. There was no doubt that we all liked really good food and we were very thankful for each other and all that we have. Here is a photo of the Wilder family on Thanksgiving Day… Next up our final stop in FL and our trek out and westward. Great having all of over for thanksgiving dinner. Really good seeing you guys while you were in Fl. Keep enjoying and stay safe. nice pictures..keep”em coming Danbo..and HoneyBO. Good stuff. Kinda’ chokes me up. Keep them coming and thanks.